Escrow.com, the pioneer of online escrow services, is pleased to announce that they will be selling an autographed bass guitar signed by all three members of the band RUSH. All of the funds from the sale of the autographed guitar will benefit The Fender Music Foundation, a national music charity. The black Fender® Geddy Lee Jazz Bass® is listed for sale on Reverb.com through January 28, 2013, and will be on display at the Fender Music Foundation table within the private NAMM Show in Anaheim. Once the bass is sold, Escrow.com will waive all fees to the winner and the Foundation as the funds are paid through Escrow.com’s escrow system. Andrew K. Sokol, General Manager of Emerging Markets at Escrow.com, also sits on the Board of The Fender Music Foundation as the Chairman of the Grants Committee. “I’ve been involved with the Foundation for many years and obtaining support from corporate entities is paramount to our success in providing musical instruments to music education programs across the country,” said Sokol. Escrow.com’s services are available worldwide and eliminate risk for manufacturers, for non-payment, and retailers, for non-delivery or misrepresentation of goods. When using the service, both parties agree to the terms online and the retailer sends the agreed-upon funds to Escrow.com. The company then verifies the payment and instructs the manufacturer to ship the goods. Upon delivery, the retailer has a pre-determined amount of time to inspect and accept the goods. Once accepted, the funds are released by Escrow.com to the manufacturer. The cost of using Escrow.com is extremely reasonable in comparison to other payment options and can either be paid in full by one party or split evenly between the manufacturer and the retailer. The Fender Music Foundation is a public 501c3 charity that provides musical instruments to programs across the nation. They select grant recipients based on the sustainability and success of their music programs that give more people the opportunity to make music. The Fender Music Foundation offers operates from funds received through sales, including transactions on their online store where the public can purchase authentic celebrity music memorabilia. Reverb.com is also stepping up their participation by agreeing to donate an additional 10% of the sales price to the Foundation. Reverb.com, created by the Chicago Music Exchange, leads the industry on the buying and selling of vintage and used instruments. NAMM attendees can view the guitar at The Fender Music Foundation table within Fender’s NAMM booth, #300, at the Anaheim Convention Center. This annual, trade-only music product trade show supports the $17 billion global music products industry. 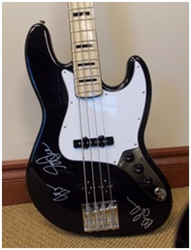 To purchase or make an offer on the Rush autographed bass, please visit http://www.reverb.com/rushbass. Headquartered in Rancho Santa Margarita, CA, Escrow.com, a privately held company, has pioneered the process of online escrow services. The Company, founded in 1999 by Fidelity National Financial, has established itself as the leading provider of secure business and consumer transaction management on the Internet. All escrow services offered on this Website are provided independently and exclusively by Internet Escrow Services(SM) (IES), one of the operating subsidiaries of Escrow.com. IES is fully licensed and accredited as an escrow company and is subject to compliance with all applicable nationwide escrow regulations.